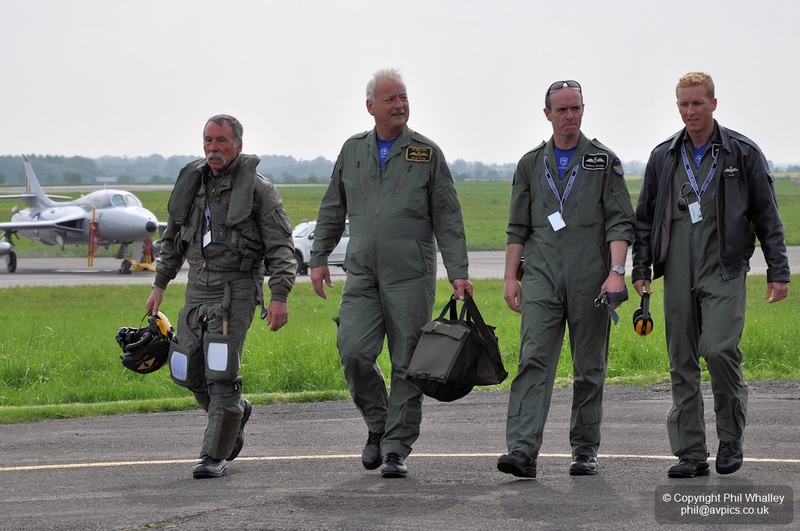 At the onetime RAF Kemble – once home to the Red Arrows – a new display team gave their inaugural display to announce their arrival on to the air display scene. 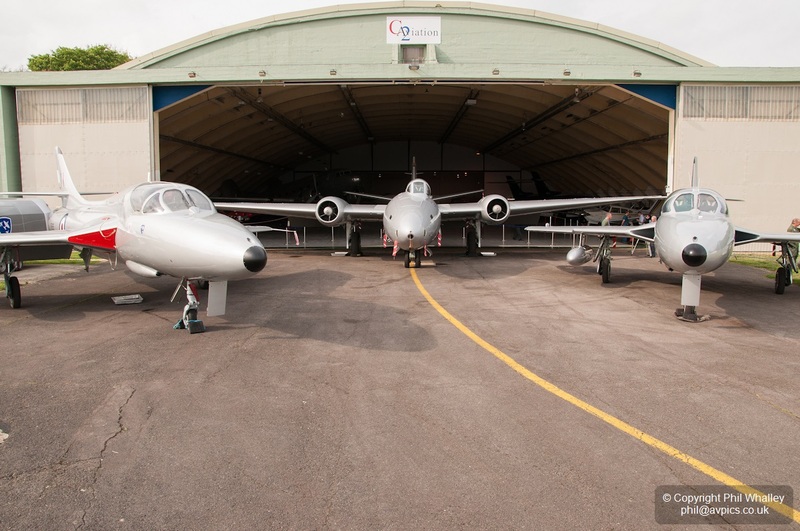 Canberra XH134 made its debut at the Goodwood Revival in September 2013 (Goodwood Revival 2013), and that has been followed by Hunter T7 XL577 returning to the air for the first time since 2009, just this week, resplendent in its new silver scheme. 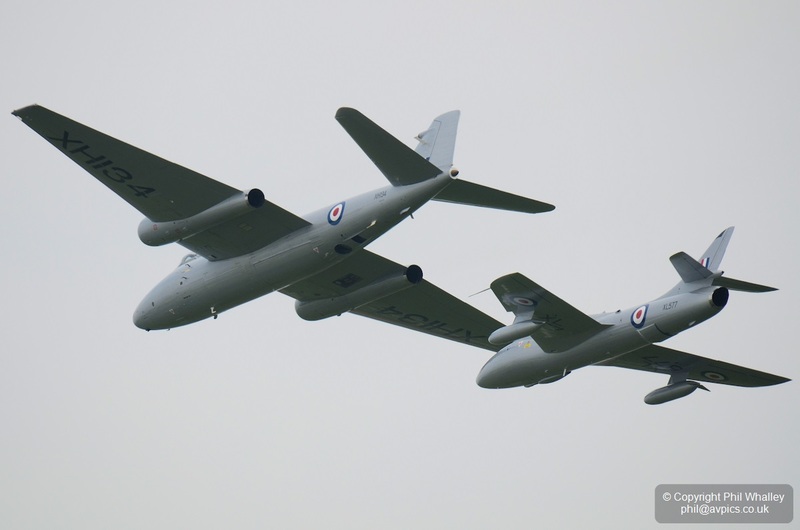 Twenty-three PR.9 photo-reconnaissance Canberra versions were built by Shorts from 1955, with XH134 constructed in 1959. 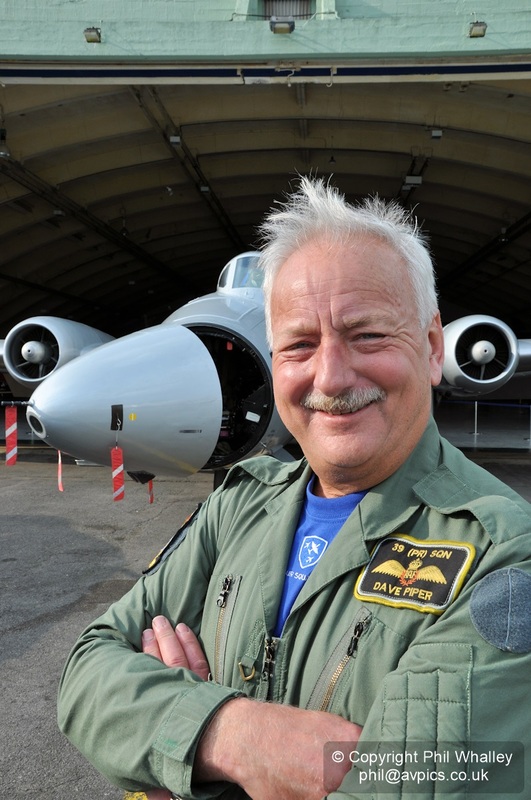 They served with three RAF squadrons from 1960, but from 1976 just with 39 squadron, latterly at RAF Marham in Norfolk. PR.9s have carried out operations at hot-spots around the world, more recently including Bosnia, Iraq, Rwanda, Kosovo, Somalia and Afghanistan, right up until the type’s retirement in July 2006. In the final months of service just three Canberras were in use; XH131, XH134 and XH135. 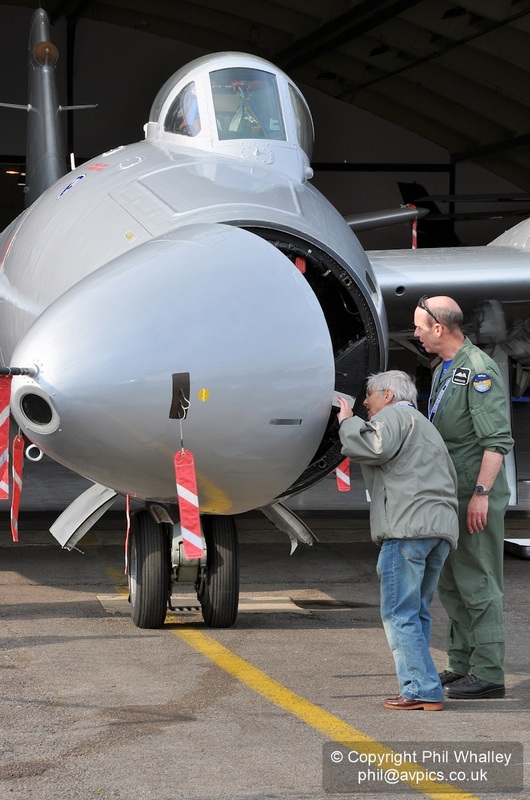 XH134 was painted with a special retirement tail scheme and became the focus of attention as the Canberra era drew to a close. At its height the Canberra force comprised 63 RAF and Royal Navy squadrons, with over 800 of all variants serving the country from bases around the world, and was also an export success, so these last few months of operations before retirement were seen as a focal point for a celebration of one of the all time greats of aviation – and XH134 took centre stage. 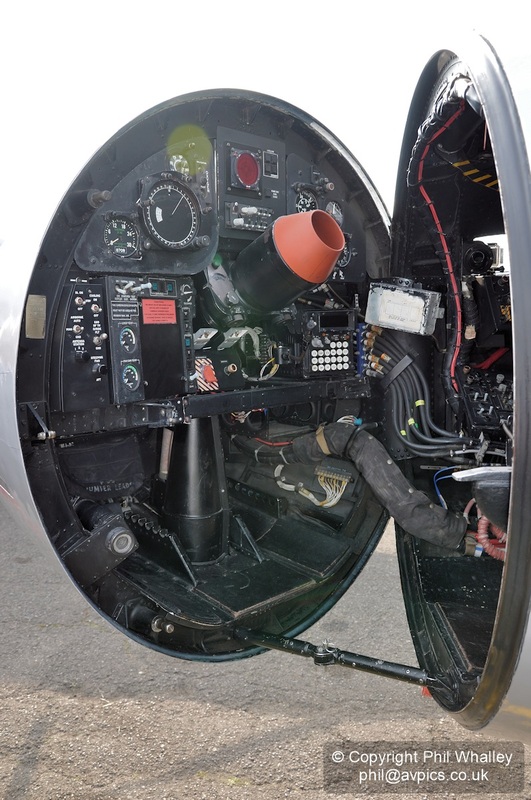 It was displayed at airshows and made special flypasts, sometimes as part of a formation – including with the Red Arrows in their current Hawk jets. 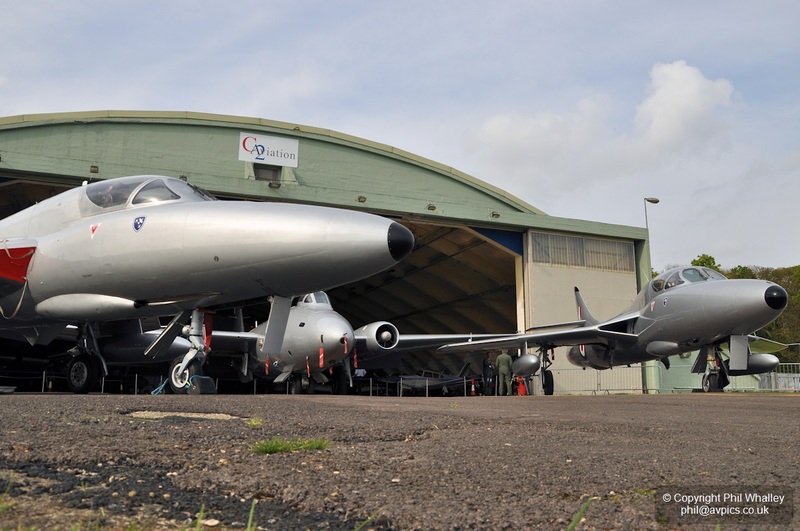 The end of the Canberra’s stalwart service for its country took place on 28 July 2006, with all three aircraft being transferred to a new owner at Kemble. XH131 returned ‘home’ by road to the Ulster Aviation Society in 2010, leaving ‘134 and ‘135 at what is now titled Cotswold Airport. 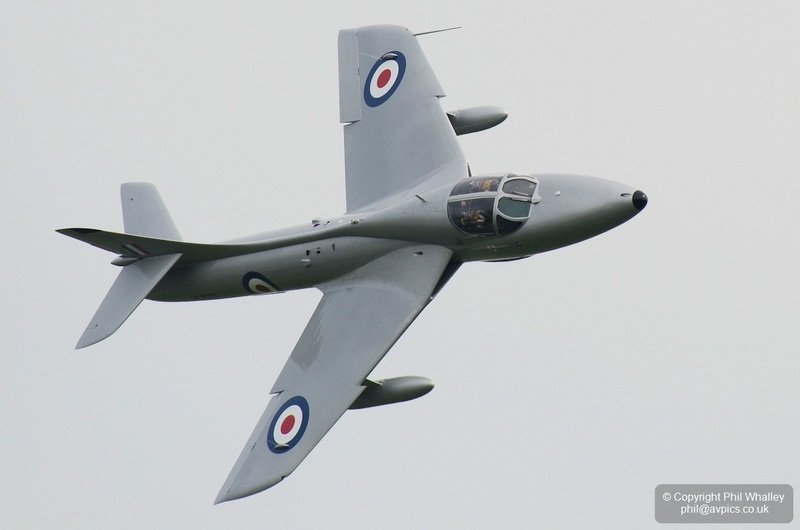 C2 Aviation Ltd. was formed in 2013, and owners Midair stated that their objective was to create ‘The Midair Squadron’ which would comprise XH134 and the addition of two Hawker Hunters as a package available for airshows and commercial advertising work – including the possibility of having company logos applied to the aircraft. 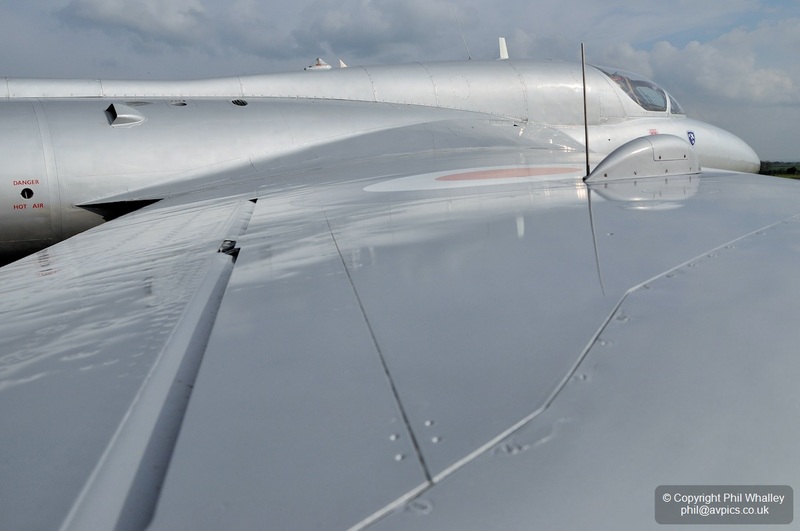 To this end it was decided that all of the aircraft would be repainted into all over silver as a ‘blank canvas’ which sadly would mean the loss of XH134’s special tail scheme, although that has been carefully recorded. ‘134 made its maiden flight in civilian ownership on 19 July 2013, just in time to fly the short distance to Fairford for a static appearance at the Royal International Air Tattoo later that day. 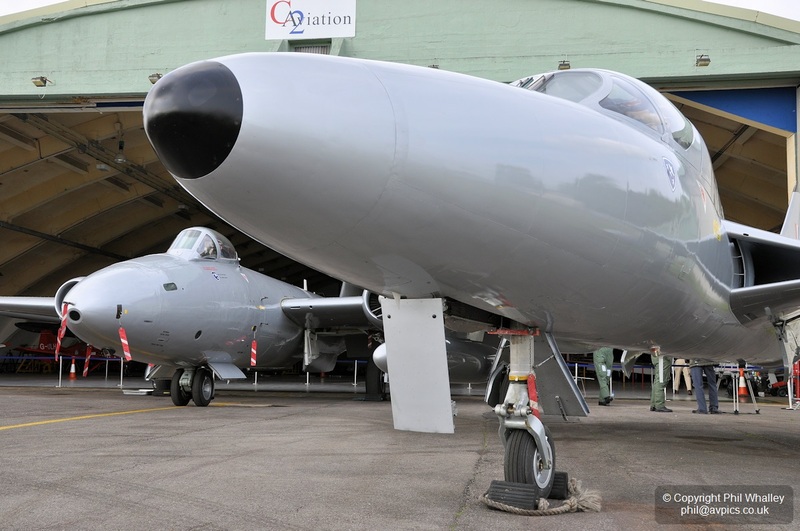 At this point the Canberra was still in its RAF hemp colour scheme, giving the public a last chance to see it before repaint. XH134 came out of the paint shop in its new scheme on 2 September with thoughts moving to its first display appearance in the air. 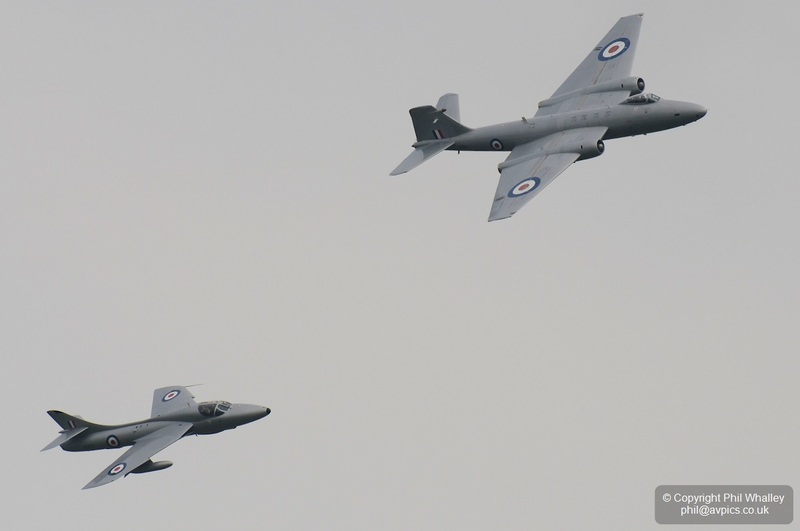 Certain strict criteria would need to be met before the Civil Aviation Authority would grant permission for Midair to display the Canberra, but that they did and with the mountain of paperwork in place ‘134 made its display debut at the Goodwood Revival just eleven days later, to the great delight of the aviation community. 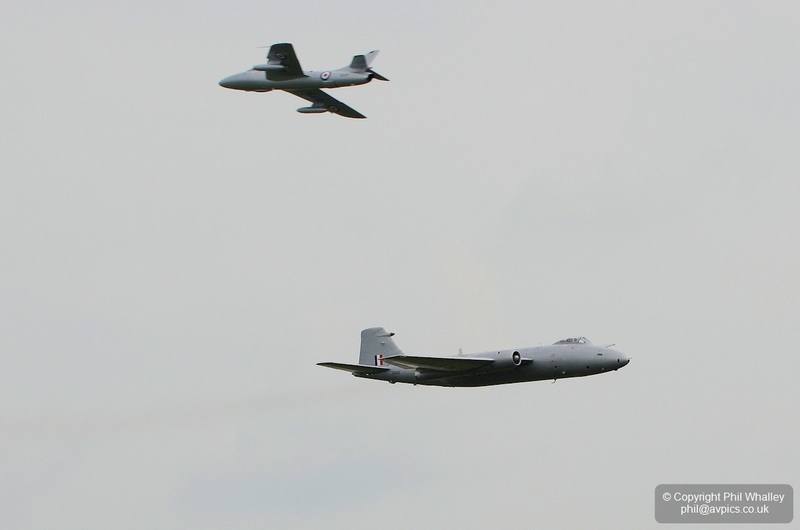 It is currently the only flying Canberra in the UK. Hunter XL577 first flew on 30 April 1958 (making the event its fifty-sixth ‘birthday’), and was previously with Delta Jets on the airfield until their demise. 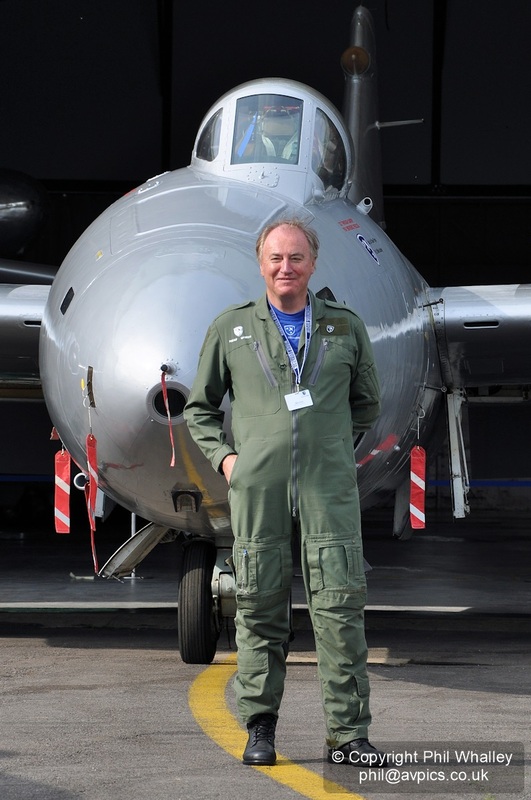 The second Hunter planned to join the Squadron is XL600 which is currently stripped and undergoing major work towards making it airworthy. 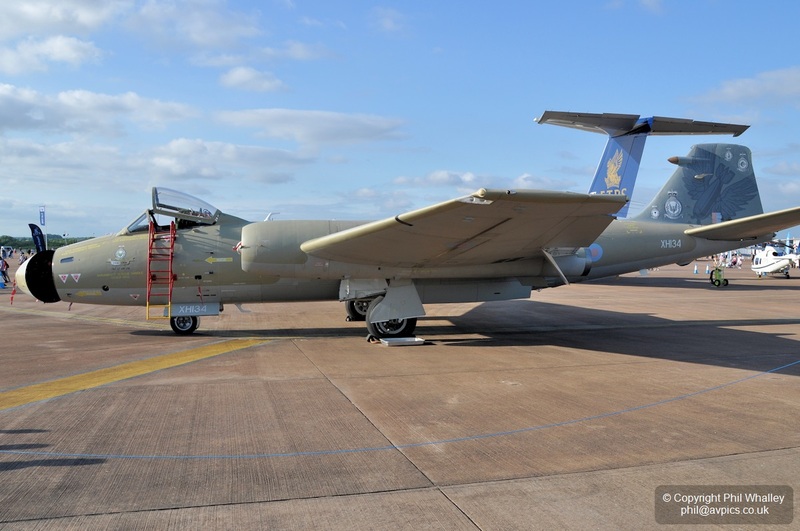 The other silver Hunter seen in the images is non-airworthy T8 XE665 named ‘George Wellesley Wesley’ which was also previously with Delta Jets. “Today marks the start of the busy display season for the Squadron, one which we’re very much looking forward to and delighted to have become involved in”. 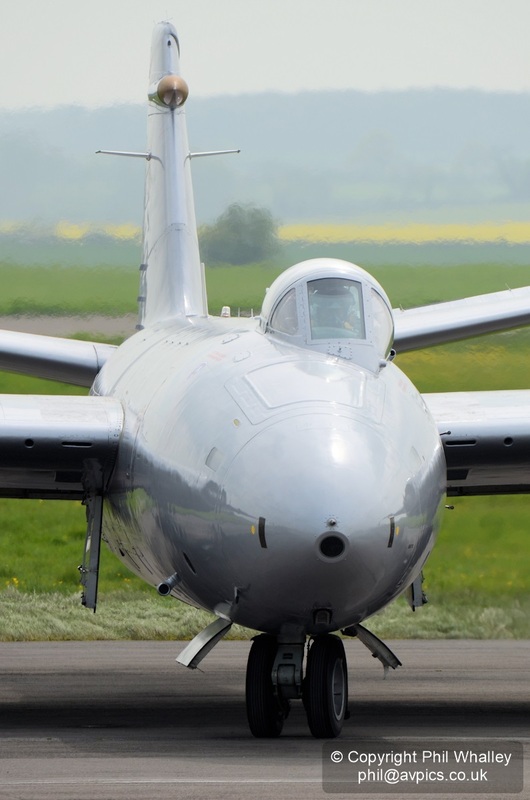 The Midair Squadron is scheduled for their first public display at the Abingdon Air & Country Show on Sunday 4th May, followed by the Canberra displaying at Llandudno Air Show at the end of the month. 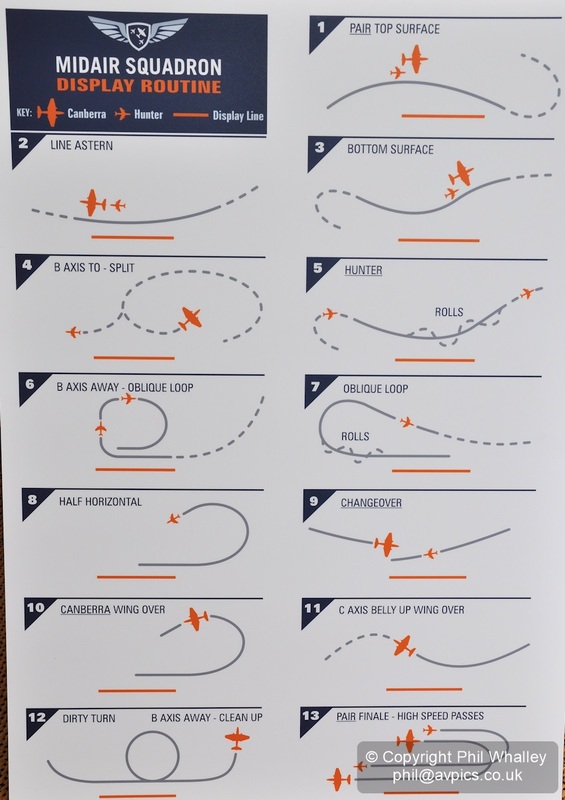 The Midair Squadron will be seen at international events throughout the coming season. 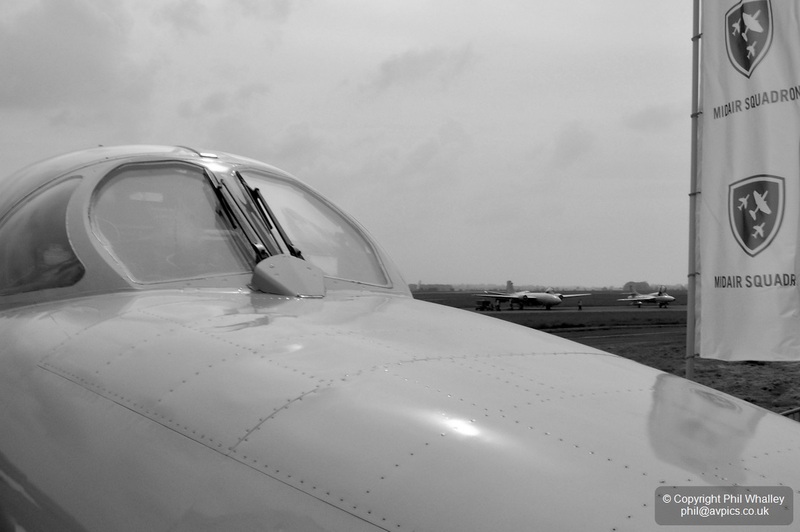 Further details of the events will be found on www.midair-squadron.com. They’ll most definitely be a highlight at any show at which they appear.